UNITED NATIONS, March 1, updated -- Kofi Annan in his new position as joint UN - Arab League special envoy to Syria met Thursday afternoon with the Permanent Representatives to the UN of Iran, Russia, Syria and the UK, and the Chinese Deputy Permanent Representative. Inner City Press learned of the meetings, held in the Protocol office of the UN Department of Political Affairs, and at first waited outside. Later the sessions were opened for a photo opportunity at the beginning; at the end, Inner City Press asked attendees what had been accomplished. Click here for China & UK clips; for Iran click here and embedded below. Syria's Permanent Representative Bashar Ja'afari told Inner City Press, "We explained to him what we had to explain." Before saying more, he indicated, he had to report to his capital. Iran's Permanent Representative Mohammad Khazaee, entering with a cane and a single deputy, joked to Inner City Press, "So I'm meeting with Kofi Annan?" Inside the small meeting room, he joked to Annan that he looks like his foreign minister, Ali Akbar Salehi. Maybe it's the beard, Annan joked back. On his way out, Ambassador Khazaee told Inner City Press "we just had a cup of tea," and "it was a good meeting." Before Annan's next session, at 6:15 pm, a staffer of the Department of Political Affairs arrived and asked Security, who is the next appointment? When he was told, the USG of Peacekeeping Herve Ladsous, the DPA staffer quickly said, we don't need any photographs of this one. And so Inner City had to leave. One wondered if why meet with Peacekeeping, if the stage is mediation? Sources in the UN Department of Political Affairs opine to Inner City Press that Ban Ki-moon either does not like or feels inferior to Kofi Annan. So, after the US "vetoed" Boutros Boutros Ghali, "who made Ban appoint Kofi?" While Ban sided with NATO in the Libya conflict, and drew criticism from Russia, Annan has positioned himself as in favor of dialogue and mediation in Syria, and not a military solution even as Qatar and Kuwait, for example, call for arming the Free Syrian Army. 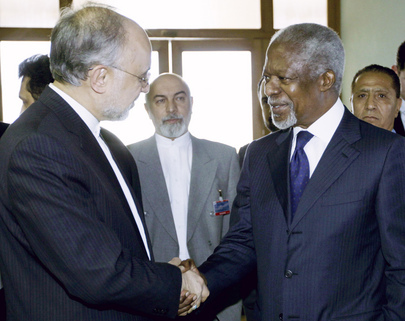 Even Annan's meetings Thursday reflect his differences from Ban. Where is this all headed? Watch this site. Footnotes: When Annan left the Department of Political Affairs hallway at 6:50 pm, Inner City Press asked him about the meetings. He declined to comment, including who requested the two final meetings. Meanwhile the UN still won't answer on finances. With Annan on Thursday was "Mister Lamine;" Inner City Press inquired and got it confirmed, it's Lamine Cisse, who worked with Annan while he was Secretary General. We'll have more on this.